Character information for Rikku, a protagonist of Final Fantasy X. Included are her background, stats, skills, and overdrives. Formerly a young girl with an unknown identity, Rikku hid her secret from the party to avoid persecution from those who follow the ways of Yevon. Eventually, her cover was blown and, despite being an Al Bhed, was later accepted by the Yevonite members. Her lineage is reputable, with Cid, the leader of the Al Bhed, her father, and her brother a pilot and a Blitzball expert. Attributes-wise, thieves are known to possess high Agility, Accuracy, Evasion, and Luck. Rikku only achieves half of these but her skills match the job class. 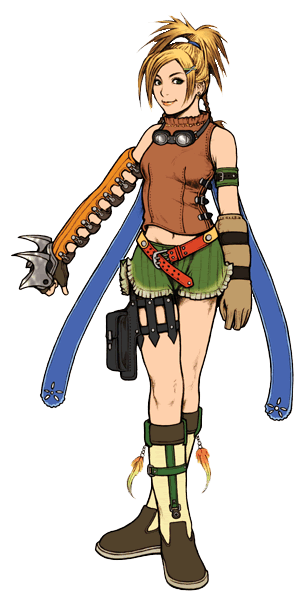 Similar to most thieves in other Final Fantasy titles, Rikku specializes mostly in steal skills, which employ snatching items, gil, and can additionally deal damage while robbing their targets.